I’m excited to talk about another Evolved Publishing author and book today, as it is truly one of my favorites. I took this book along with me on a trip to the beach this summer, beginning it during my long layover in La Guardia airport. It had been a while since I had time for pleasure reading, so I figured I’d get the book started, and then finish while basking in the warm, southern sunshine. I was still in that ratty old airport chair when I turned the last page. I literally could not put this book down. The characters were so personable, one of them reminding me of my best friend in high school — sweet, but a wry sense of humor that makes you laugh out loud even in the most perilous of situations. The suspense of the story never let up; in fact, I’d say that about four chapters in, I knew I’d be sitting in that airport chair when I finished. At a couple of points, I even glanced nervously over to the gate area to see if the flight attendant had announced boarding yet. That’s right, I didn’t want to get on the plane yet, I didn’t want to go to the beach. I wanted to finish this awesome book. I won’t delve too much into the story — I insist you read it for yourself — but I’ll give you the synopsis and a little more info about the book’s awesome author, Angela Scott, below. Have a question for Angela about the book? Post a comment — she’ll be stopping in throughout the day to check on them! And be sure to click on the link to enter a raffle to win the book! 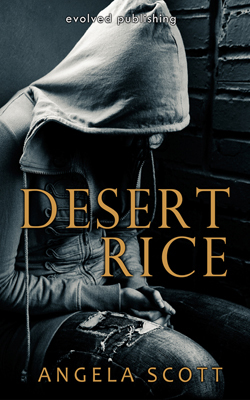 About Desert Rice: Samantha Jean Haggert is a beautiful twelve-year-old girl, but no one knows it. All they see is an awkward boy in a baseball cap and baggy pants. Sam’s not thrilled with the idea of hiding her identity, but it’s all part of her brother’s plan to keep Sam safe from male attention and hidden from the law. 15-year-old Jacob will stop at nothing to protect his sister, including concealing the death of the one person who should have protected them in the first place–their mother. Sam and Jacob try to outrun their past by stealing the family car and traveling from West Virginia to Arizona, but the adult world proves mighty difficult to navigate, especially for two kids on their own. Trusting adults has never been an option; no adult has ever given them a good reason. But when Sam meets “Jesus”–who smells an awful lot like a horse–in the park, life takes a different turn. He saved her once, and may be willing to save Sam and her brother again, if only they admit what took place that fateful day in West Virginia. The problem? Sam doesn’t remember, and Jacob isn’t talking. About Angela Scott: I hear voices. Tiny fictional people sit on my shoulders and whisper their stories in my ear. Instead of medicating myself, I decided to pick up a pen, write down everything those voices tell me, and turn it into a book. I’m not crazy. I’m an author. For the most part, I write contemporary Young Adult novels. However, through a writing exercise that spiraled out of control, I found myself writing about zombies terrorizing the Wild Wild West–and loving it. My zombies don’t sparkle, and they definitely don’t cuddle. At least, I wouldn’t suggest it. You can find me at my website, where I blog obsessively about my writing process and post updates on my current works. I’m also on Twitter and Facebook, but be forewarned, I tweet and post more than a normal person. Don’t forget to stop by the Evolved Publishing pre-holiday blog hop. We’ve got 20 autographed books up for grabs! From thrilling young adult adventures to suspense nail-biters, thought-provoking literary novels, bright and cheery books for children, an uplifting memoir, to romance, we’ve got something for everyone on your holiday-shopping list. I CANNOT wait to read Desert Rice. I’ve only heard amazing things about it. Just gotta get my reading schedule cleared out, then bam! I ❤ this book. Seriously. Fantastic! I don’t know what intrigues me the most, the book’s blurb or the author’s presentation? So I’ll read the book to figure out! This is an amazing book!! Thank you for participating in the blog hop! !